Job organizing the garden or mowing the yard of the ordinary man is often done manually, it seems that now will soon be replaced by machines. Yes, it's undeniable. 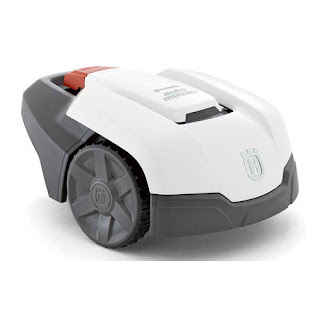 Over the past few years with quite an impressive roll out its products, Husqvarna is now reportedly has just added one more to the ranks of the fleet robotic lawnmower, or better known as the robotic mower engine model with paved latest creations named Automower 305. Unlike some of the sibling that is designed to assist and meet all your real estate needs of the job is bigger, Automower 305 can be reserved for the work in lower-middle-scale or home-based jobs. For the owners of the terrace, garden or yard that is somewhat limited with a total area of ​​500 square meters can reportedly use the services of this sophisticated lawnmower robot. Given the facts, machine-made robotic mower from Husqvarna can move dilandasan ground with speed 35 cm / s. And it certainly will very likely be able to do diving work is done manually because human beings can be resolved within a period of rapid and precise. To avoid any unwanted things, robotic lawnmower is equipped with several advanced security features and functioning properly. Owned security features here involves the use of a PIN security and a built-in alarm function to prevent theft of the robot from the parties who are not responsible. Its own weight about 7 pounds, and is certainly heavy enough for people who intend to take it instead! This device is supported by the presence of Li-Ion battery / 1.6 Ah is able to turn on or functioning of the movement of autonomous activity of about 40 minutes for charging (charge) of energy for 150 minutes. Since the charging process is fully automated, the rest of this robot does not need human help at all. Coupled with the presence of a wire 150 meters and 200 staples that allow users to do the set-up perimeter cuts are quick and easy course. Regarding the price per unit itself, Automower robot lawnmower model 305 has been ready for the market with prices quite expensive at 1490 euros or about 18 million dollars. Hm, you want him?